Who's Afraid of AAC? 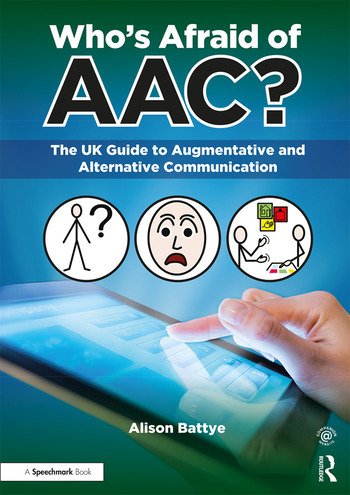 is a clear and concise guide to Augmentative and Alternative Communication (AAC) in the UK and will be an essential resource for all Speech and Language Therapists, educators, parents and carers supporting children with non-verbal communication. summaries of recent research and hot topics including eye-gaze technology, using AAC in exams, and internet safety so that you have the most up-to-date guidance at your fingertips. Created by a Speech and Language Therapist who specialises in AAC training for therapists, educators, and individuals with communication needs, as well as parents and carers, this is the only book of its kind written for a UK audience. Alison Battye is a practising Speech and Language Therapist who specialises in working with children with Complex Needs and Autism Spectrum Disorder. She has worked across mainstream and special school settings from Foundation Stage to Further Education, supporting practitioners in implementing AAC with children and young people.